Grand Theater Station (Chinese: 大剧院站; pinyin: Dà Jùyuàn Zhàn), literally means "Dajuyuan Station", is a station of Shenzhen Metro Luobao Line. It started operations on 28 December 2004. It is located at the underground of the junction of Shennan Donglu (Chinese: 深南东路) and Jiefang Road (Chinese: 解放路) in Luohu District, Shenzhen, China. Its name is from Shenzhen Grand Theater (Chinese: 深圳大剧院). It is near Shenzhen Book City (Chinese: 深圳书城). It is an interchange station between Luobao Line, Shekou Line and the future Neihuan Line. If passengers want to transfer from Luobao Line to Shekou Line or from Shekou Line to Luobao Line, he or she should up to the Lobby of B1F at first. 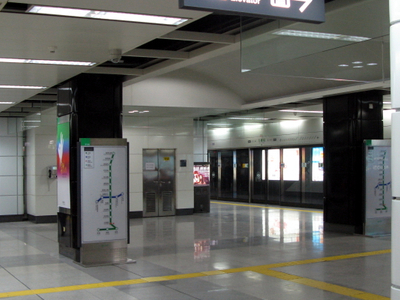 Here's the our members favorite photos of "Metro Stations in Shenzhen". Upload your photo of Grand Theater Station!